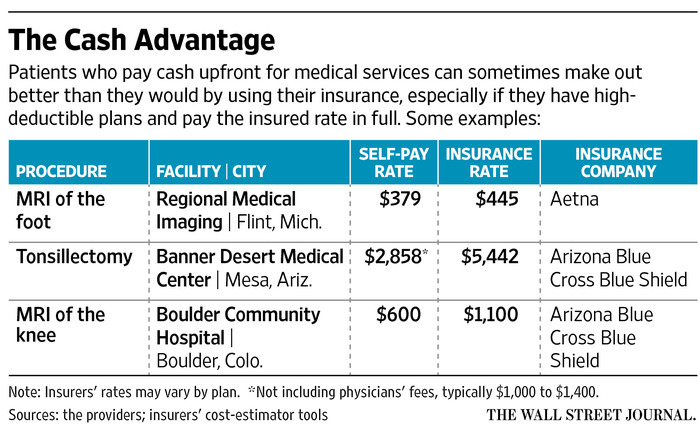 As consumers get savvier about shopping for health care, some are finding a curious trend: More hospitals, imaging centers, outpatient surgery centers and pharmacy chains will give them deep discounts if they pay cash instead of using insurance. When Nancy Surdoval, a retired lawyer, needed a knee X-ray last year, Boulder Community Hospital in Colorado said it would cost her $600, out of pocket, using her high-deductible insurance, or just $70 if she paid cash upfront. When she needed an MRI to investigate further, she was offered a similar choice—she could pay $1,100, out of pocket, using her insurance, or $600 if she self-paid in cash.